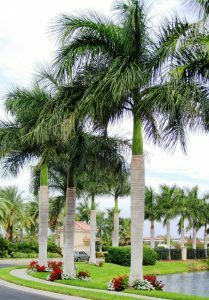 Cuban Royal palms grace Sarasota and Venice landscapes in a cool, calm and collected way. In fact, ArtisTree remembers Tommy Bahama selling “Stay Palm and Carry On” shirts – a play on words for “Stay Calm and Carry On.” Well, for us, calm/palm both speak to the Cuban Royal. You just sort of get this inner-peace thing going the minute you see one. Dare we call it a Zen-like experience? Often chosen by tropical resorts, these fast-growing gentle giants are commanding but quiet, with smooth silvery trunks that swell at the base. Long, luxurious feathery fronds are glossy green, arching 10 feet long to form a canopy that spreads to 25 feet. Looking up 50 or 70 feet, you might wonder if these peaceful palms could serve other useful purposes, and the answer is yes. Grown on Cuba’s hillsides and valleys, they’re used for thatch roofs, timber and hog feed. But let’s not wreck our Zen-like moment. 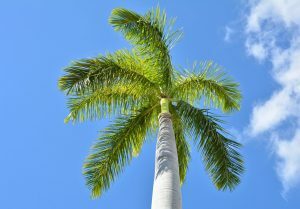 Called “the most beautiful palm in the world,” Cuban Royal palms captivate as an architectural accent, in clusters or in stately rows throughout Sarasota and Venice. They need plenty of space for fronds to spread out, so we plant them about 15 feet away from a house and 25 feet apart. While they’re moderately salt and drought tolerant, these self-groomers prefer full sun and are fond of water (although they’re not too fussy about soil). No wonder Ernest Hemingway loved these palms. What about you? Your next new quiet spot could be under your very own calm palm — ever-majestic Cuban Royal palms that will lift you away from the cares of the world. We invite you to schedule a consultation with one of ArtisTree’s award-winning designers.